How can we design relationships between the most primitive and the most sophisticated life forms? Can we design wearables embedded with synthetic microorganisms that can enhance and augment biological functionality? Can we design wearables that generate consumable energy when exposed to the sun? We explored these questions through the creation of Mushtari, a 3D printed wearable with 58 meters of internal fluid channels. The wearable is designed to function as a microbial factory that uses synthetic biology to convert sunlight into useful products for the wearer. It does so with a symbiotic relationship between two organisms: a photosynthetic microbe – such as microalgae or cyanobacteria - and compatible microbes – such as baker’s yeast and E. coli - that make useful materials. The photosynthetic microbe converts sunlight to sucrose – table sugar – which is then consumed by compatible microbes and converted into materials such as pigments, drugs, food, fuel and scents. This is a form of microbial symbiosis, a phenomenon commonly found in nature. The wearer would ideally be able to trigger the microbes to produce a particular substance – for example a scent, a color pigment, or fuel. 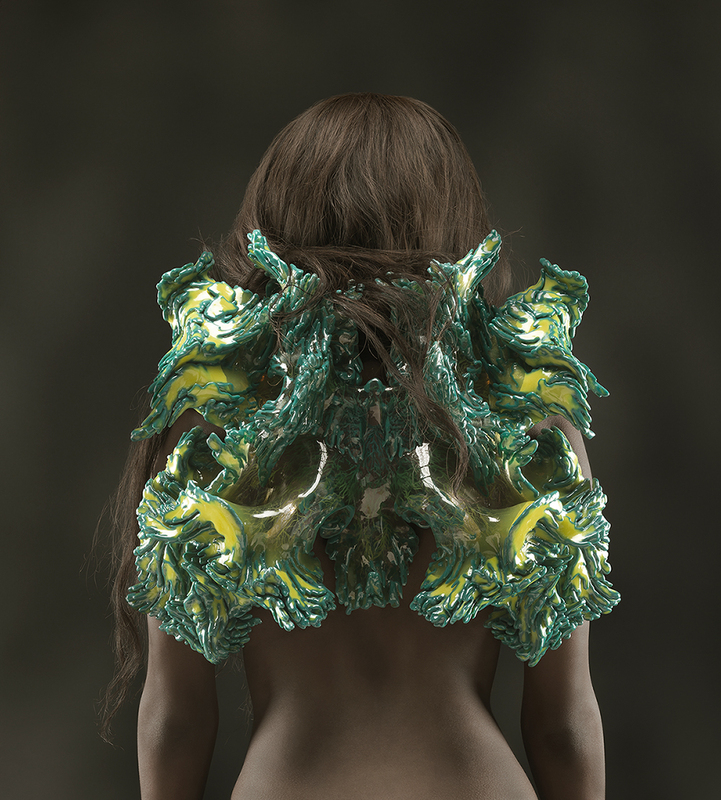 The wearable was designed using generative growth algorithms. These computational form generation processes mimic biological growth by generating recursive forms over many iterations of the algorithm. Initial geometry and parameters defined by the algorithm inform the overall geometry, the local mesh geometry as well as variations in material property by altering the relative strength of relaxation, attraction and repulsion between mesh vertices. For Mushtari, the initial geometry and parameters created a single long channel that grew over numerous iterations into a wearable with 58 meters of inner channels varying in diameter from 1 mm to 2.5 cm. Transparency was graded regionally within the design to create areas where photosynthetic microbes could receive light and produce sucrose. Mushtari was 3D printed using the Objet Connex3, a color multi-material 3D Printer developed by Stratasys. Printing internal channels required an innovative support solution. Typically, the Objet Connex3 dispenses a gel-like support material into internal channels that cannot be cleared. To overcome this barrier, the Mediated Matter group collaborated with Stratasys to develop an experimental liquid-based support that could be dispensed into the channels during printing and easily cleared afterwards. 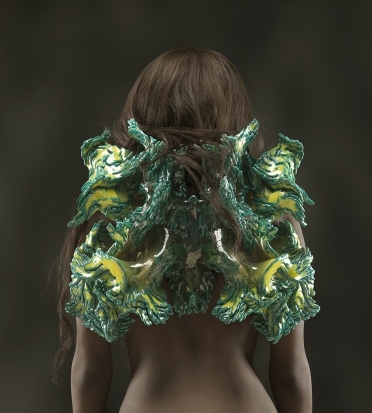 Directed by architect and designer Neri Oxman, Living Mushtari was completed by the Mediated Matter Group in collaboration with Stratasys as a part of the Wanderers collection. Will Patrick of Mediated Matter was the lead researcher on the project. Additional collaborators include Christoph Bader and Dominik Kolb; Prof. Pamela Silver and Stephanie Hays of Harvard Medical School; and Dr. James Weaver of the Harvard Wyss Institute for Biologically Inspired Engineering. Mediated Matter researchers included: Will Patrick, Steven Keating and Sunanda Sharma. Mushtari was designed as part of the Wanderers collection, an astrobiological exploration dedicated to the medieval astronomers who explored the worlds beyond by visiting the worlds within.